It’s All Rock and Roll to Me! Rule #4 – Pick the background and let the action happen (again, always true). Although we had been back from Copenhagen for less that 48 hours, we were invited by my friend Rupert to the 4 on the Floor Concert at the Minnesota Zoo. 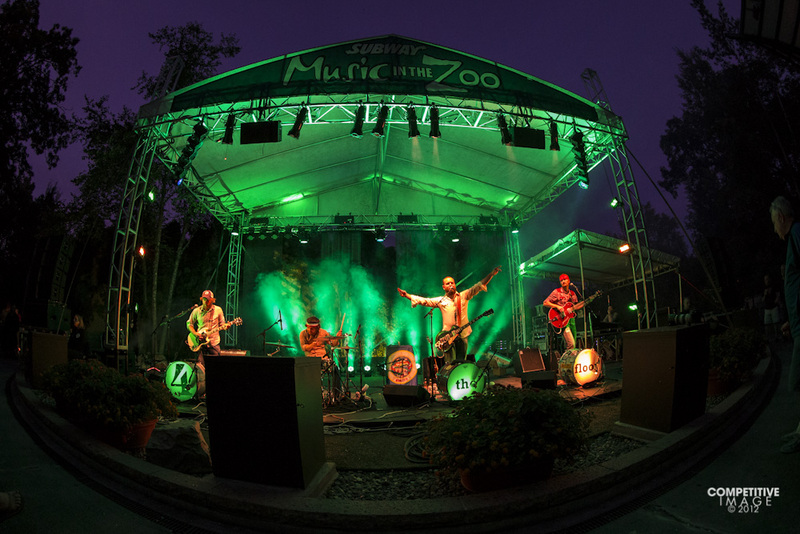 Not only is it a great venue for a concert and a beautiful Minnesota summer evening, but it was also a great opportunity to really test the capabilities of my new Canon 1Dx. I will write more about using at the Olympics, but what I was shooting there was outdoor and during the day. Rock concert light, and usually the lack of light, is certainly more challenging than shooting during the day. You can be the judge, these were all shot at 2,500 ISO, the first image was with my 8 to 15 mm f/4.0 Canon fish-eye and the remaining where with my 70 to 200 mm f2.8 IS II. Personally, I think the results are pretty amazing. You can click on the first image to see a larger image and see the details a bit better. Finally, here is Rupert working the crowd and shot at ISO 6,400! Although I have neither recovered nor gotten caught up from the adventure in London at the Olympics, I arrived in Denmark for the 2012 Challenge Copenhagen Triathlon. This is my second year shooting and as I had expected Thomas Olsen and his crew were again extremely well organized and efficient. Unlike the prior two year’s the weather in Denmark has been uncharacteristically spectacular. It was almost as if the Danes were not quite sure what to do with so much sun! Bright blue skies, billowy clouds and amazing crowds all along the course. I spent most of my day out on the 2-lap bike course and 4-lap run course, while my partner in crime Nancy wandered through the crowds to show how much fun everyone was having. It is truly an amazing venue for the race. The field of 25 pros started off at 7:00. 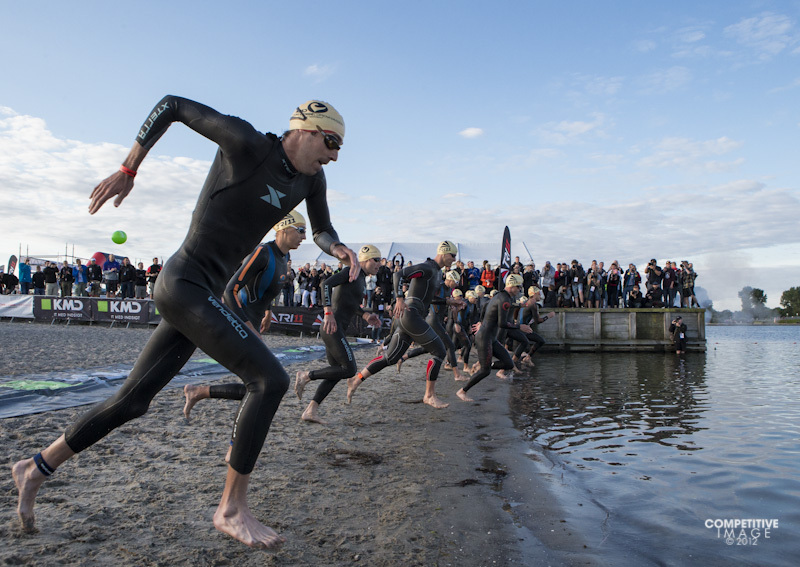 Over 2,000 triathletes took to the relatively warm water. The 1-lap swim course passed under several bridges which gave spectators an unusual opportunity to see their friends. The top pros were tightly packed at the swim exit. There was amazing scenery on the bike course, from the Danish coastline to the rolling farmlands. Here the athletes roll past a huge apple orchard. The run course is 4 laps through downtown Copenhagen visiting both the harbor areas as well as the ultra-modern sections. Both the bike and the run courses pass the Queen’s Library, known as the Black Diamond. 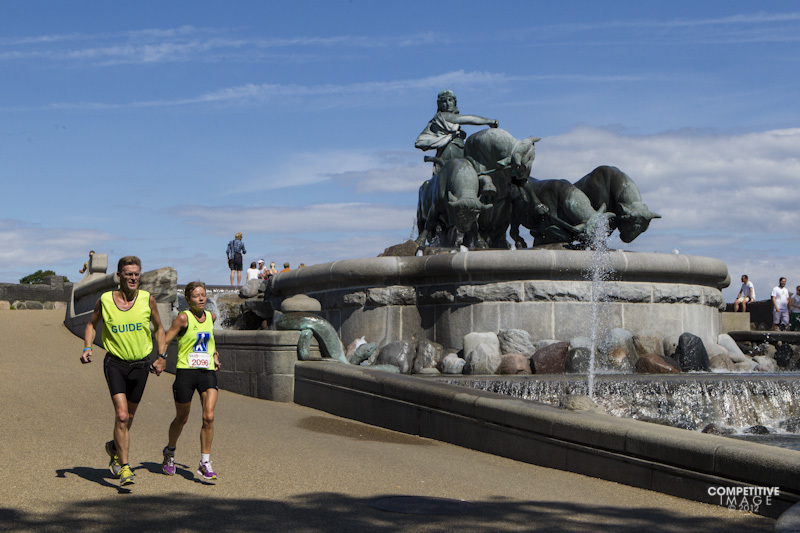 A blind runner and her guide pass the Gelfion Fountain. Aussie Aaron Farlow took the lead on the bike and never looked back! Dane Camilla Pedersen, although a fall on the run put her race in danger she recovered for the victory. Now for a bit more work and a bit of touring in this truly wonderful city. In the past I have mentioned that I have rules, I don’t have very many but there are a few that are really important. Perhaps the best known rule is that You have to shoot the cute girls! I mean, who wants to look at old guys like me? A more complete explanation is that if you shoot the best looking athletes, with the best form, your photos will be most appealing. Finding a group to shoot is easy in Triathlon and especially around the time of the Women’s Athlete Briefing. Greg Welch of Ironman fame and with Oakley was on hand to distribute Sunnies with frames in team colors for the girls that sponsored by Oakley. Hanging out with Welchy is like a magnet for attracting the athletes. I just had to stand there and shoot. Here are a few relaxed and very happy snaps from the day. The man of the day – Greg Welch, Ironman World Champion! Team Australia Erin Densham, Emma Moffatt and Emma Jackson. Sarah Groff with the huge Triathlon Grandstand in the background. Oakley’s in team colors with the commemorative London cases. And of course, my friend Sweden’s Lisa Norden. More soon – off to the Olympic Park again today! Even though the London course has been set for the last couple of years and many of the women have raced here, some even had their qualifying race one this course, there have been many miles in between. From 6:30 to 7:15 AM, they girls had a chance to get out and ride a couple of easy laps of the complete course. Some rode alone, some with teammates and many with coaches. Here are a few snaps from their preview ride. I would be worried if Sarah Groff were not in her typical playful mood. Sarah and Laura Bennett settled in for a couple of easy laps. Gwen Jorgensen rode with USAT High Performance Leader Jono Hall. Paula Findlay was out early. Reigning World Champion and local Gold Medal favorite knows the course but takes advantage of the available time. After their ride the girls had a chance to swim the course. Just beyond the first turn of the one lap swim, the Olympic Rings glow in the early morning sun. Jono meets Gwen at the swim exit. Laura and Sarah opted out of the swim this morning. Not only were the girls practicing on the course but so were the operators of the remote TV camera which runs on cable stretched over kilometer moves over the swim course and transition area. I couldn’t help but stop and drool over the row of BMW F650 GS motos, which is my ideal to shoot from. Unfortunately, I will not get one for the races. Although the course familiarization is not until Thursday morning, I headed to the race venue to look around. I have shot on this course the last two years, but from the previews I knew that everything at the start finish area would be bigger. I walked in through the media room, which was also for the Open Water Swimming events, but it is at least four times the size of the room we had for the ITU events the last two years. Here is the view upon walking out into the grandstand. Great finish line grandstand seating 3,000. The blue carpet is still covered, but the finish line is ready to go, with photo stands for 96 photographers! Part of my reason to be on site today was identify the spots I want to shoot on race day. This one looks good to me. Unfortunately, I subsequently learned this spot is not available, and I had to submit a written request for the swim exit positions on the sides. The Olympic greets the athletes as they exit the water. Running into T-1 they will see 3,000 screaming fans! The bike racks are in place, just waiting for placards and bikes. Even from across the Serpentine, the magnitude of the stadium area can be seen. Although the race is centered within Hyde Park, on the seven lap bike course, the racers exit the park, go through Wellington Arch and the around the circle in front of Buckingham Palace, and back through the Arch and into the park. As only the British weather forecasters could say, It will be a Damp and Dull in Guildford today. While the weather was a bit gloomy, the day was anything but dull. Thanks to great facility at the Surrey Sports Park, Hunter headed to the pool for an early morning swim. While local master’s swimmers have the left 4 lanes, we have right half of the pool. This morning it was all for Hunter. After his swim and a good breakfast, Hunter settled in to watch the swim heats live from the Olympic Aquatic Center. While he was watching, he thought he might as well put in a couple of hours on the CompuTrainer. When Hunter finished his spin, the CompuTrainer moved to Gwen’s room. Under the watchful eye of Gwen’s Coach Cindi Bannink, they are both watching the rowing heats! Just an easy ride, with a few pick ups. What is that cadence? Right from her bike Gwen and Cindi headed out to the Rugby fields for a few long laps. Cindi was kind enough to give me a few minutes warning as to when they were wrapping up, so I can get a head start getting to the field. The Surrey Sports Park is the home of the Pro Rugby Team, the Harlequins. Gwen and Cindi caught their attention on the run. As always, Gwen displayed her excellent form. Manny Huerta and training partner, Leonardo Chacon, Costa Rican Olympian were wrapping up their ride. After lunch and a siesta Manny did a light run for a NBC / Telemundo Interview. Here their cameraman left his HD camera and used his skateboard and GoPro for some actions shots. Manny took a few minutes to check email before his interview. Finally an in depth interview (in Spanish of course) with Francisco Cuevas from NBC / Telemundo. Post interview, I headed back to London with John Martin. Today, I am heading back to Olympic Park and Central London.